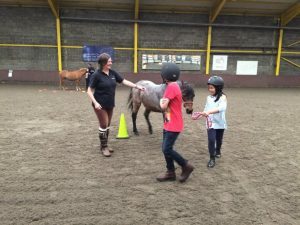 School and community groups can access riding and stable management sessions at SBS as either one off or weekly sessions for a term or half term. Riding sessions are suitable for absolute beginners and we can tailor stable management sessions to work alongside any curriculum the riders are completing in class. Term bookings will have structured learning outcomes and each individual will receive a certificate of achievement. We offer riding only sessions and riding and stable management sessions. Riding only is suitable for up to 8 riders for 45 minutes. 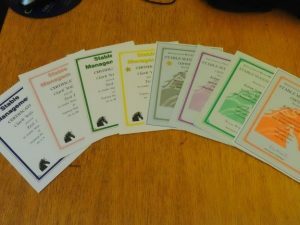 Riding and stable management is suitable for a group of 12 children. 6 children will ride for 30 minutes while 6 participate in 30 minutes of stable management before the groups swap over. If you have any other requirements please contact the office for information. We also run ‘Gallop for Growth’ sessions. These sessions have been specifically developed to improve children’s confidence and self esteem. In these unique sessions children work in small groups with horses from the ground. It is a unique learning experience giving young people the opportunity to work closely with horses in a way that they may never have been able to before. In this video you can see how a Gallop for Growth session works. All our instructors are qualified coaches holding either UKCC or BHS qualifications. Please visit the ‘Testimonials’ page to see what some of the schools have said about the sessions. We are a Newcastle Council approved Alternative Provision provider, accredited to deliver ASDAN (Award Scheme Development and Accreditation Network) qualifications in addition to equestrian qualifications. Through our alternative provision, we encourage young people to have a more positive attitude towards lifelong learning and prepare them for the transition to adulthood and working life. The young people have the opportunity to gain ASDAN, BHS (British Horse Society) and ABRS (Association of British Riding Schools) qualifications. We help young people to build confidence with peers and adults in authority and increase their understanding of society’s expectations. 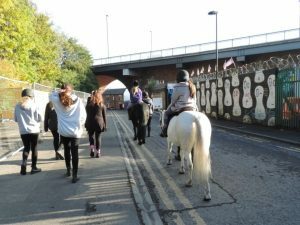 Stepney Bank Stables offers an alternative learning environment for young people who find classroom teaching difficult. The day starts at 9:30am where young people will meet their youth worker and change into their yard boots (which are provided by Stepney). Then it is onto the yard where young people get the opportunity to interact with the horses and ponies while completing tasks such as grooming, tacking up and filling hay nets. Young people get to see what owning a horse or a career working with horses is really like. Following this, young people will have the chance to exercise the horses from the ground and complete tasks such as lungeing, loose jumping or leading in hand – all exciting and hands on experience with the horses. ASDAN is the next task to be done. Young people will work on a new task every week to develop their knowledge and understanding of animal care in order to recieve their ASDAN Animal Care Short Course qualification. Tasks range from investigating the needs of a crocodile in transit, to researching the dangerous dogs act, creating animal-based board games, to possible career paths in the industry- meaning there is always something interesting to look into. After a 30 minute lunch break, young people may have the opportunity to take part in a riding lesson where they will develop their equitation skills and work towards ABRS tests. After this, it is back onto the yard to complete afternoon tasks such as cleaning water drinkers and food bowls, throwing up the muck heap and more grooming before the end of the day at 2:30pm. We work closely with schools and local pupil referral units to ensure that the young people who come to us get the most out of their time with us.